2-channel 100W tube guitar amp head with a blue LED backlight for the super-cool factor. 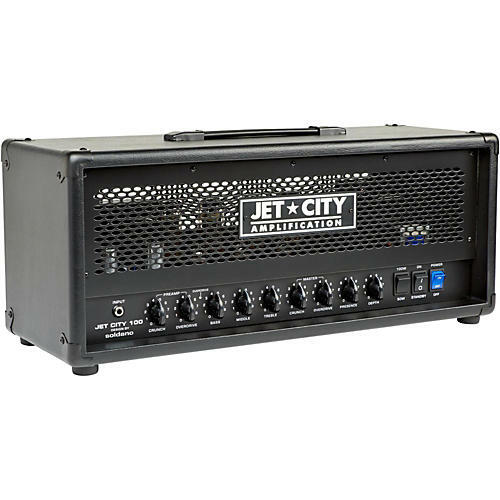 Jet City Amplification's flagship 100HDM Amp Head is two channels of Soldano tone and 100 watts of pure tube power. The Crunch channel has plenty of headroom to deliver clear, bright clean tones and can be driven hard enough to get downright raunchy. The Overdrive channel is the circuit that made Soldano famous. The HDM version also includes the famous Soldano Depth Control, and a metal front baffle, standard. The 100W/50W brings the pain from four 6L6 output tubes in 100W mode, or in 50W mode two tubes are turned off causing the power section to work harder to reach the desired output level, resulting in some pretty hot power amp distortion. Rounding out the feature set is the wire-mounted blue LED, just because it looks cool. This LED is socket-mounted so it can be replaced with other colors, a daisy-chain of several LEDs, or removed entirely. Controls: Normal and Overdrive Gain, Bass, Middle, Treble, Normal and Overdrive Masters, Presence, Depth. 100W/50W. Footswitch: Overdrive channel footswitch, included. Pump up your rig with this amp head today!